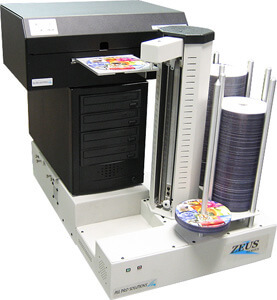 Zeus Series consists of automated standalone and networked CD DVD Publishers, configured with 2, 4, or 7 DVD CD or Blu-Ray duplicators drives and integrated with inkjet or thermal CD DVD Blu-Ray Printers. The Zeus series systems also include an embedded PC with Windows 10 and all necessary networking and labeling software preinstalled. The disc capacities range from 220 to 900 depending on the printer chosen. Within the Zeus Series, three different production jobs can be run with the same machine: copy-only DVD CD Duplicators, copy and print CD DVD Publishers, and print-only automated Printer Autoloaders. Multiple Zeus CD DVD Blu-Ray Publishers can exist on the same network and run simultaneously for high volume CD Duplication needs! The powerful network software allows for seamless integration into any local or remote network, be it a small office network, or a large corporate environment with thousands of employees. Each employee with access to the Zeus CD DVD Blu-Ray publishers will be able to submit their job to the queue at anytime, no matter the number of copies, and their jobs will be produced in the order it was submitted to each of the CD publishers or DVD publishers. Zeus DVD Duplicators will operate in the same manner as the publishers, just without the ability to print on the discs. 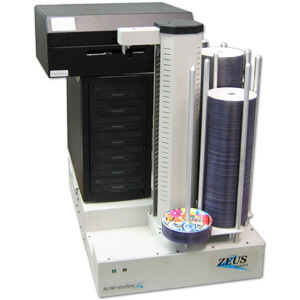 Because of the Asynchronous duplication process, the Zeus DVD duplicators are the fastest loading and unloading DVD CD duplicators in the industry. For more information on our CD publishers, please click on one of the “Read More” buttons above. All Pro Solutions is a leading manufacturer and innovator of CD DVD Duplicators and Blu-Ray Publishers. Offering the largest selection available, All Pro Solutions is setting the standard for the CD Duplication industry. From low-end, entry-level CD Duplicators to highly advanced and network-based, mission critical Blu-Ray DVD CD Publishers systems, All Pro Solutions has everything covered! The mid-range category consists of the Zeus Series automated standalone and networked CD DVD Publishers, configured with 2, 4, or 7 DVD CD or Blu-Ray Duplicators drives and integrated with inkjet or thermal CD DVD Printers. The Zeus series systems also include an embedded PC with Windows and all necessary networking and labeling software preinstalled. The disc capacities range from 220 to 900 depending on the printer chosen. 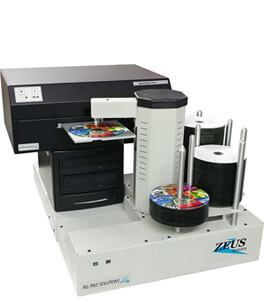 Within the Zeus Series, three different production jobs can be run with the same machine: copy-only DVD CD Duplicators, copy and print CD DVD Publishers, and print-only automated Printer Autoloaders. Multiple Zeus DVD CD Publishers can exist on the same network and run simultaneously for high volume CD Duplication needs! The high-end category consists of the Olympus Series automated, standalone and self-contained CD DVD Blu-Ray Publishers. The systems are network-based and consist of 2, 4, and 7 CD DVD or Blu-Ray Duplicators drives, a fully embedded PC running Windows operating system and advanced network production software, and integrated with either inkjet or thermal CD Printers. Like the Zeus Series, the disc capacities range from 220 to 900 depending on the printer chosen. Users simply add a monitor, keyboard, and mouse for a complete and powerful Blu-Ray DVD or CD Publishers. The Olympus Publishers are the most advanced DVD CD Publishers systems of their kind. With the latest version, users now have the option of creating and submitting CD Duplication images via any web-based browser regardless of the operating system. Simply go to the IP address assigned to the Olympus DVD Publishers to create and submit jobs remotely over the web. For more information on the many advanced features, visit the Olympus Blu-Ray Publishers product pages directly. Systems in both Zeus and Olympus series can all be easily configured with the following printers: SpeedJet inkjet DVD printers, and Pro III monochrome thermal transfer CD printers.